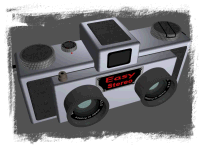 A tool for building video files from a set of pictures. A software for building (stereoscopic) videos from a set of still pictures with various effects as zoom, pan and transitions. Can generate standard AVI files, WMV files or Quicktime movie files. Input images can be in the JPEG or PNG format and videos. Input images can be monoscopic or stereoscopic (side by side images). SMB uses scripts written in a simple format for adding special effects like Ken Burns and transitions. Take a look at the demo video: Images from Mongolia. On-line help: click here to display StereoMovieBuilder on-line help. 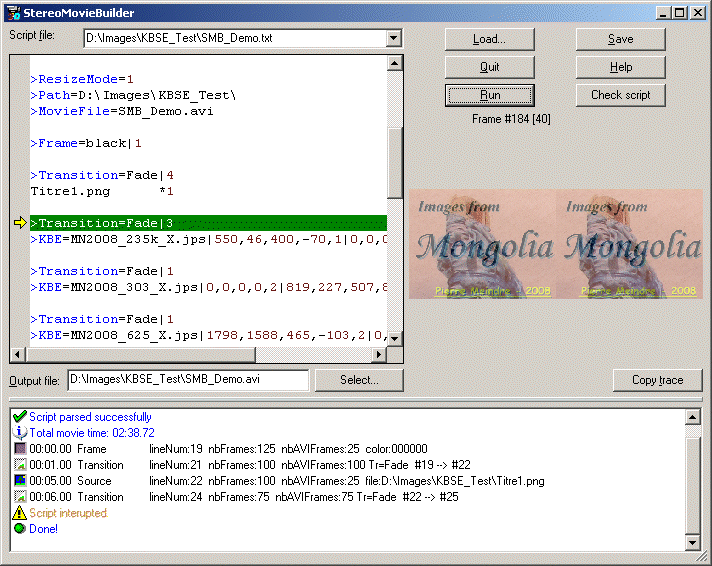 StereoMovieBuilder will run on any PC with Microsoft Windows 98/Me, 2000, XP or Vista. Installation: Extract the file from the zip archive and place them in a new folder created on the PC. For more ease of use, one can create a shortcut to the application in the "Start" menu. Click here to download a demo script and its associated files (23 MB).